November is here! I cannot believe how quickly 2012 has passed by. It seems like just yesterday I was clinging glasses with friends ringing in the New Year. With November comes the start of the holiday season–one of my favorite times out of the year. November is particularly special to me, as I appreciate its emphasis upon finding gratitude for the day-to-day things in each of our lives. To recognize this gratitude, I’m going to share one thing over the next 30 days that I am grateful for with all of you! I will also be posting gratitude inspired pictures on my newly launched Instagram account. My username is RulingSports. I hope that each of you will follow along throughout the month! You can bookmark this post, as I will be updating it daily. Additionally, I’d love to hear what you’re grateful for! Please feel free to tell me in the comments section below. 1. The generosity of my friends to help me achieve my dreams. My agent always says I need TV experience, and my friend, Ryan Peck, is going out of his way to help me get some experience. Thanks to Ryan, I will be an in-game reporter for the University of Denver men’s basketball and hockey teams this fall. 2. Friends for life. I’m an only child who always dreamed of having a sibling. I’m lucky for the fact that I have so many people I can call my “best” friends, who over time have become more like siblings. I’ve known some of them for as long as we’ve been born and others since the first day of kindergarten. We all live in different corners of the world, but they are always there to lend a hand or shoulder when I need it. Their presence in my life is one of my greatest blessings. 3. Celebrations. There are so many great celebrations this month. Yesterday was my high school friend, Brit’s bridal shower (yes, I am going to be a bridesmaid for the seventh time!). What an event that was! There were sixty women there and her sister, the Pinterest Queen, put together the most amazing spread. My mom turns 60 on Saturday and we are going to be celebrating this milestone all week long. I’m grateful to have wonderful people and special moments in life to celebrate. It’s a nice reminder that life is precious. 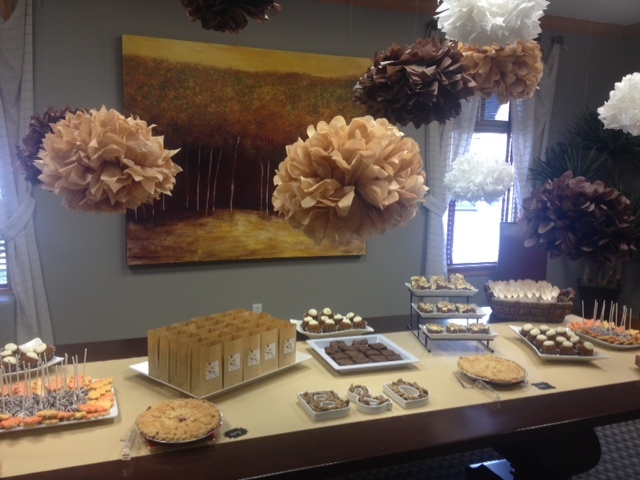 The dessert table at Brit’s bridal shower! There was also a build-your-own caramel apple bar and mini grilled cheeses over mini cups of tomato basil soup! Way too much fun! 4. Sunday mornings. Sunday mornings are one of my favorite times of the week. I either begin my day by going to church or studying the Bible on my own. Then I head to Starbucks for a a nonfat Chai latte with one of my girlfriends or with my laptop to catch up on work. After that, it’s time to watch Broncos football with my family at home or friends while enjoying lunch. In my life, Sunday’s are simple and for that, I’m grateful. 5. New beginnings. For some time after college, I thought all of the fun in life was over. To put it mildly, I had a really good time in college. I could not imagine how life could be better than being surrounded by all of my friends, all of the time. I’m grateful for finally taking adulthood in stride and for the new beginnings I’ve been given in my personal life. I’m blessed for the new people of great character that come into my life on a near daily basis. I’m thankful for the chance to learn a new person’s story and to begin building new friendships with the various people who find their way onto my life’s path. It is these experiences that make this growing up thing fun! 6. America. I’ve always been proud to be an American. However, going to law school and studying the Constitution really sealed the deal for me. Looking at framework of that document, it is so amazing what a group of men were able to do nearly 300 years ago to secure our life, liberty and pursuit of happiness today. I truly believe that the United States is the greatest country on the planet. I’m grateful for the opportunity that the Constitution gives me, as a young woman, to wake up every single day and pursue my dreams to the best of my ability.